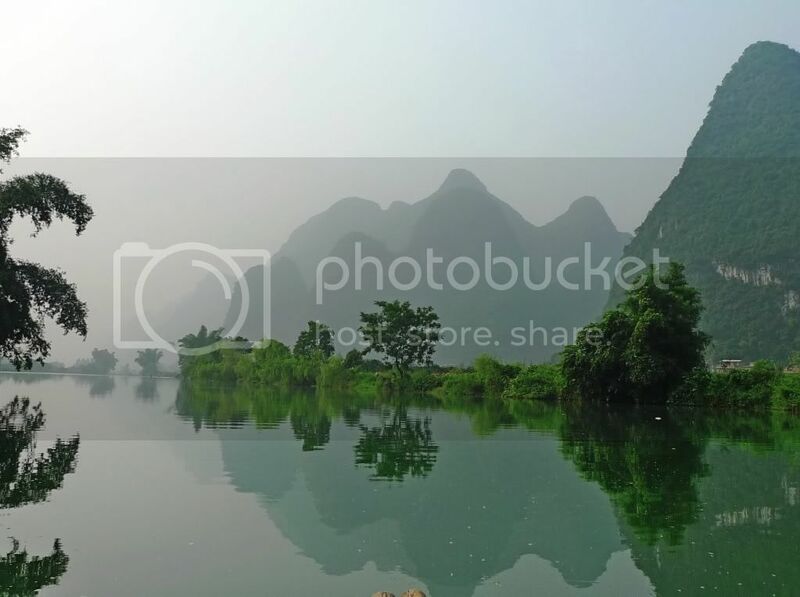 Yulong River, which is a tributary of Li River, is approximately 15 km west of Yangshuo town. It is about 43 km long but our river rafting only covers about 15 km from Yulong Bridge Pier in Baisha town to Gongnong Bridge Pier near Big Banyan. You can refer to the map here. 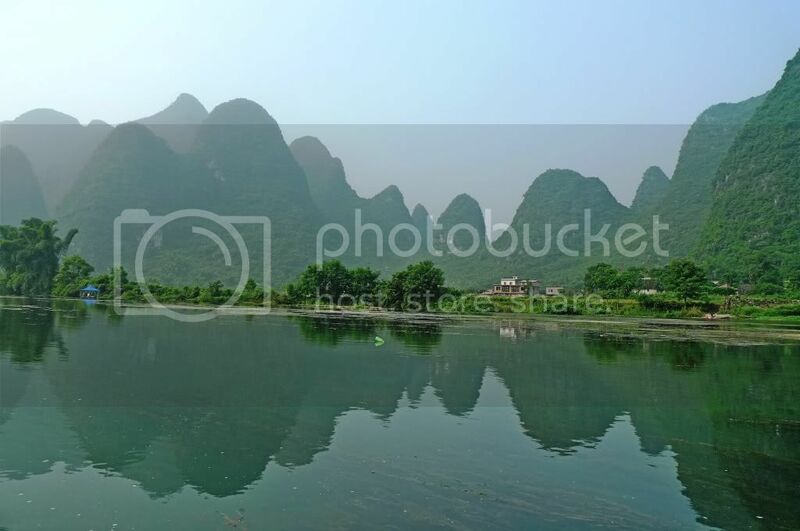 The word "yulong" means "meet the dragon" in English. 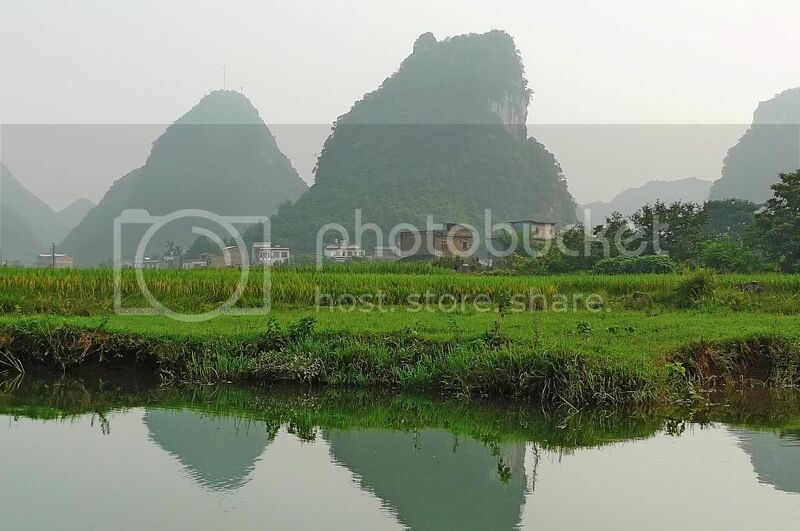 According to a local legend, a dragon from the East Sea once strolled across the Yulong River and was so taken in by the beautiful landscape that it decided to stay there forever. 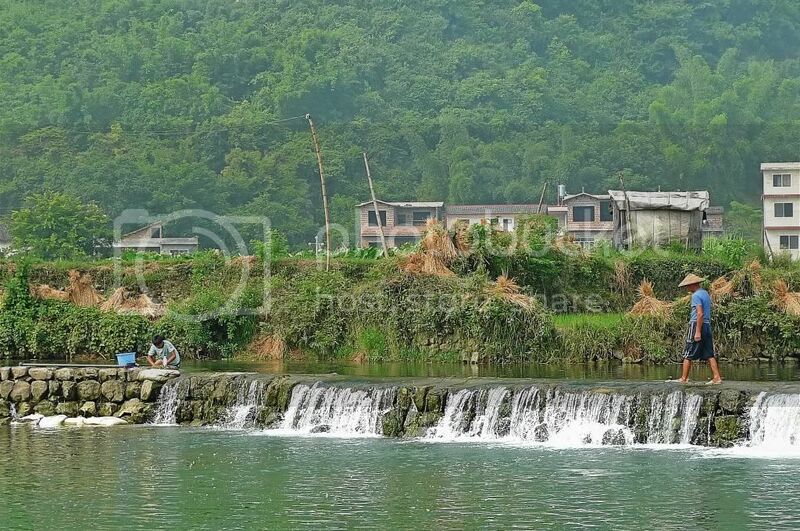 Villagers living on the river bank claimed to have seen the dragon, hence the name Yulong River. 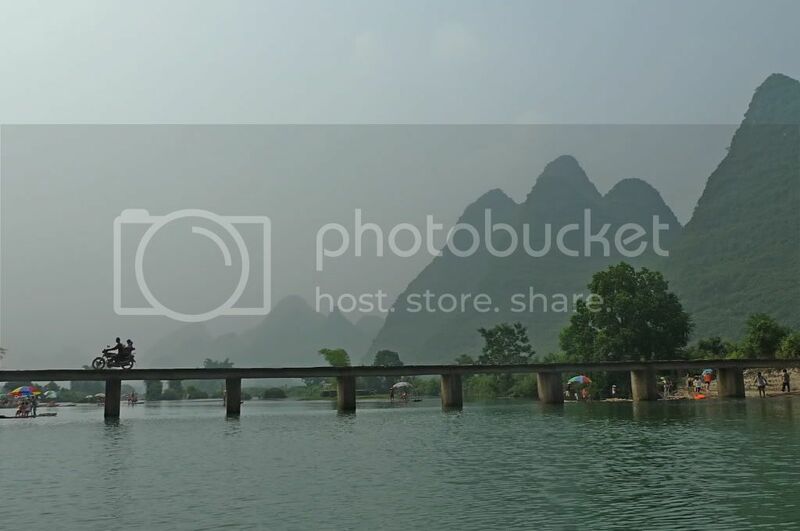 We started out from Yulong Bridge Pier. 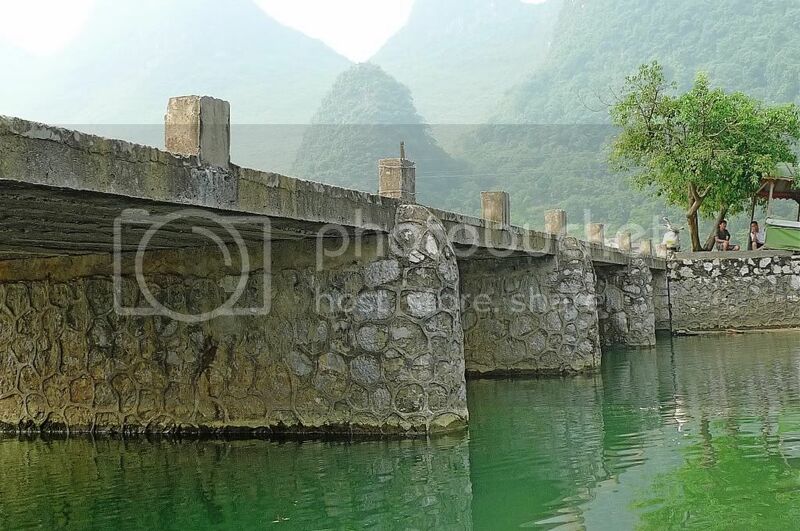 I took this photo of the ancient Yulong bridge from where I sat on the raft. It is not everyday that we get to see such ancient single-curvature arch bridge! Did you know this stone bridge is about 600 years old? There are 2 other similar single arch bridges nearby namely Xiangui Bridge and Fuli Bridge, but we did not pass them. These were houses by the river. I noticed that the river was quite shallow at certain spots. In fact, you could even see through the water to the riverbed. 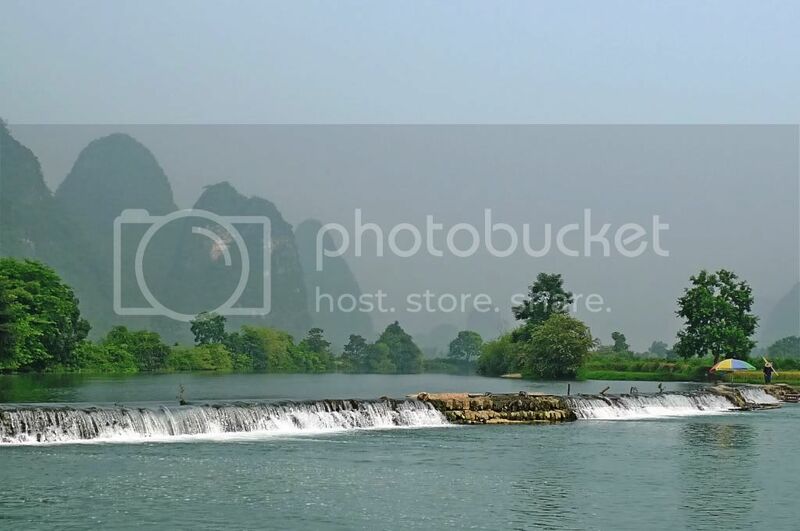 According to wikipedia, Yulong River has a maximum depth of 5 metres and an average width of about 25 metres. I found the scenery simply mesmerizing! 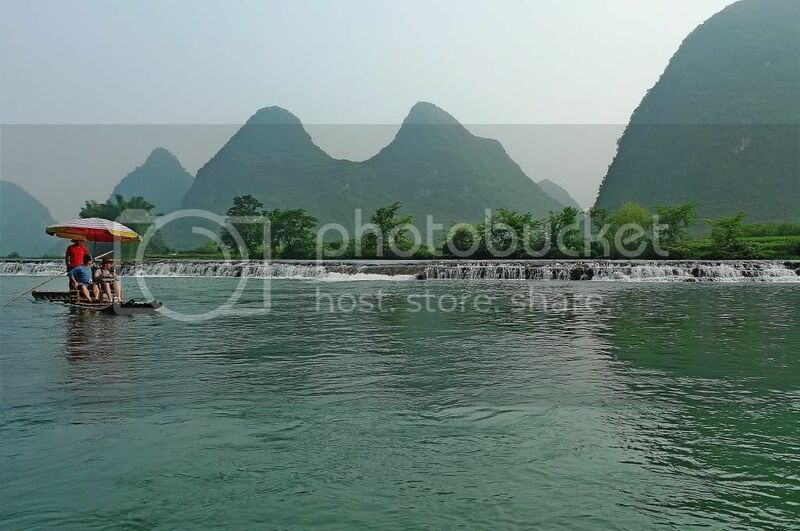 Yulong River was like Li River, only it's smaller and probably more beautiful! I love the reflections on the water! Oh! Does this look like a frog to you? It sure does to me! Jam and his friend were on one raft while I was alone on another. Of course each raft has a rafter to steer the raft. The photo below shows Jam and his friend ahead of me. Sitting on the reclining chair aboard the raft, I felt totally relaxed and was enjoying the beautiful views all around me! If it wasn't that hot, and if I wasn't busy taking photos, I would not mind taking a nap! But I soon learnt that napping was impossible and you'll know why in a moment. I was about to sit back on my reclining chair and relax myself when my rafter warned me to look out. I sat back up straight and saw this! Oh no! This must be the surprise Jam mentioned earlier. My guess was right! We were going down! Help!! I do not know how to swim and if I fall into the water, I am going to hold Jam totally responsible! I quickly capped my camera lens and held on tight. I was not going to take any photos while on the way down! Firstly, I needed to hold on tight in case I got flung out of my seat! And secondly, I did not want the water to splash onto my camera and damage it! We reached the edge. My rafter skillfully manoeuvred the raft. I held my breath as we dropped. In a matter of seconds, it was over. Looking back, I took this photo. We had just dropped down a weir dam! It was not as thrilling as dropping down a cliff, but still being my first time, it was thrilling enough for me. And if I thought this was the only weir dam we had to cross, I was wrong. Throughout the entire journey, we had to go over no less than 20 weir dams! Now you know why I said earlier that napping was impossible. But after some time, it was no longer thrilling. And I think I could take a nap while going down. Haha! The weir dams were constructed to irrigate the farmlands on both sides of the river. They were also used as walkways for both humans and animals to cross the river during dry season when the river was more shallow. Having crossed the weir dams during this river rafting, I came to trust the safety of these rafts. 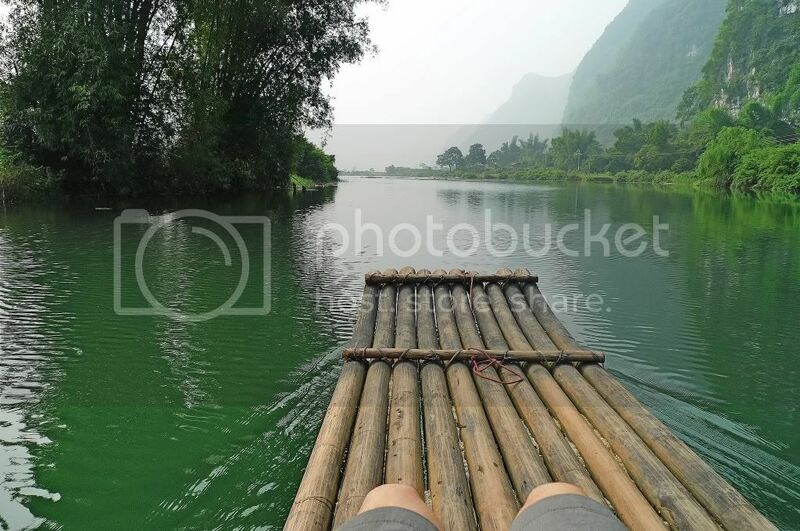 A lot of readers commented that they would not sit on the rafts as they looked risky and dangerous but from my experience, they were not dangerous at all! Not once did my raft flipped when going over the weir dams! I think the river water does not flow very fast here therefore the rafts are suitable and do not pose a risk. 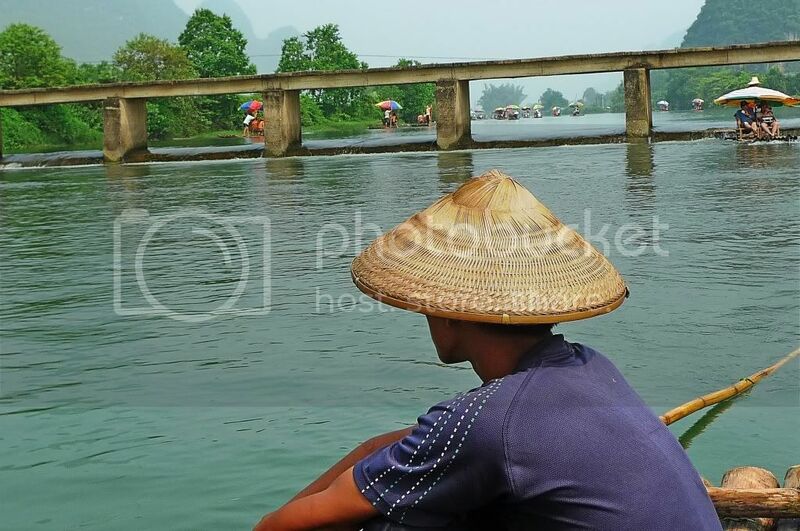 Besides, I learnt that the Chinese Government had approved the use of these rafts and the rafters or raftsmen have to undergo training and obtain licence before allowed to steer the rafts. All in all, I feel it's very safe but it would be better if they provide life jackets as that would definitely enhance our safety. After passing the first weir dam, our rafters stopped and let us down to see farmers working on the farmlands. 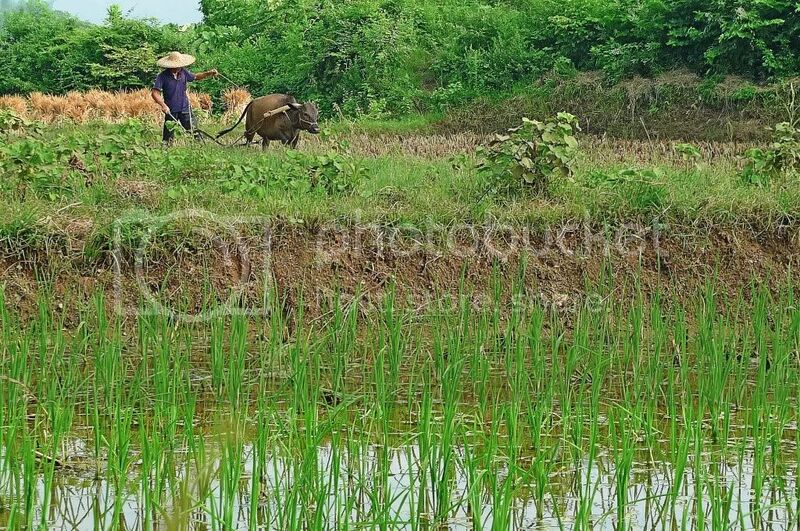 A farmer plowing in the rice fields with the aid of a cow. Do you know what these rice straws are for? After spending some time on the farmland, we went back to our rafts and continued our journey downstream. 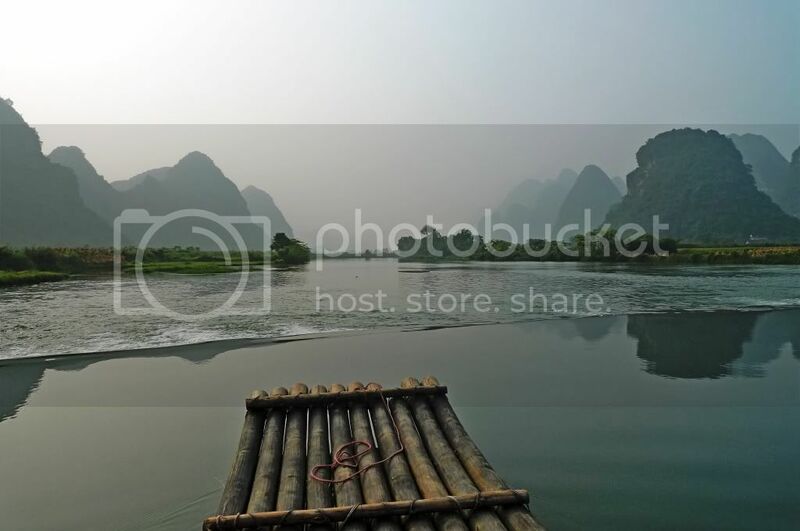 There were no motor boats plying the river - only bamboo rafts. I loved the simple, natural and rural life here! Of course, I am a city boy at heart and I still think I belong to the city. Haha! But a break from city life sure helps to rejuvenate the soul! I decided to put my leg into the water. Ooh! It's so cooling and refreshing! 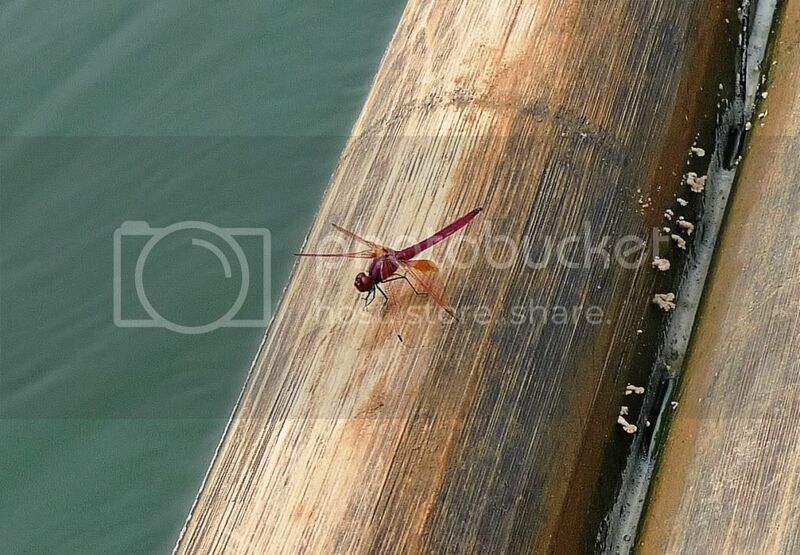 A dragonfly flew towards me and rested on the raft. I quickly snapped a photo of it. 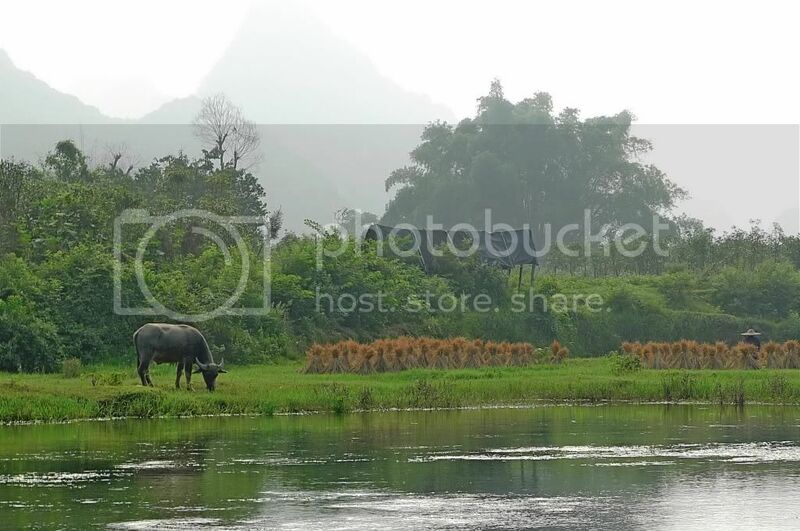 The natural landscape around Yulong River never ceased to amaze me. Look! 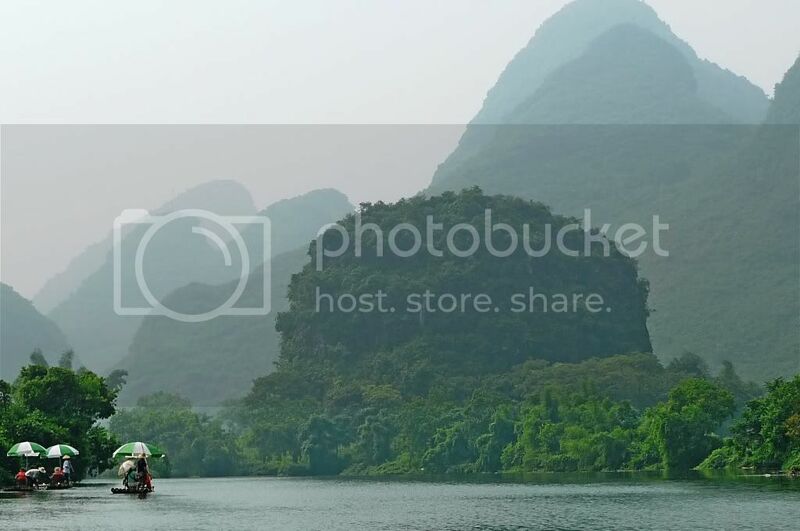 Can you see a Chinese pagoda in this photo below? No? Tilt your head to the left and you'll probably see it. My rafter pointed out the pagoda to me, but I have forgotten which of the photos I took represents the pagoda! No? Maybe I did not take the photo at the right angle. Now, this looks more like the top part of a pagoda to me! What do you think? The reflection on the water was simply stunning! Soon, we approached a bridge. I think it's called Xiandu Bridge. Here's the close up view of the Xiandu Bridge as we were about to pass under it. We had a hard time communicating with each other as he spoke mostly Mandarin and I could not understand most of it. Well, I guess I just tried my best to make out what he said. At one time, he pointed to the water and asked me to look. "Yī​diǎn​r" (Just a little) he said, smiling. I think that's the only English word he spoke actually. Haha! Wait! There's another word he knew. There was once he pointed to a hill in front and said, "Hàn​bǎo​bao! hamburger!" I looked at where he pointed and sure enough there was a hamburger right in front of me! A giant hamburger in fact, haha! Then I looked down at my feet and I saw this. Now isn't that funny? Talking about hàn​bǎo​bao! I was wearing a pair of McD slippers! LOL! As we continued downstream, the sun was getting hotter. Although the umbrella provided some shade, it was not enough. I had to reapply my sun block to avoid getting fried! We were about to approach another weir dam where we would be getting down to observe the irrigation system there. However, something unexpected happened. I met with an accident! I noticed that in your photos, some of the rivers looked green. Was it really green? Looking at the surrounding, It reminds me of the old Chines movie where Kung Fu was the highlight. I imagined there was fung sai yuk there. Ahaks! What an imagination right? Interesting (and good too) to know that the rafters are government regulated. Well, if the rafts are not safe, there'll be plenty of accidents and nobody wants to ride them, right? Wow! What an exhilarating rafting experience. Can imagine you holding on tightly on the chair with jaws wide open as you rough it off during the first weir encounter. Got arrgghhhh loudly or not? Love the pixs very much and bonus with the reflection. Sorry cannot figure out the pagoda you're positive the rafter said 'pagoda'? haha. Chicken and duck talk for five hours phew painful to both ears and tongue? 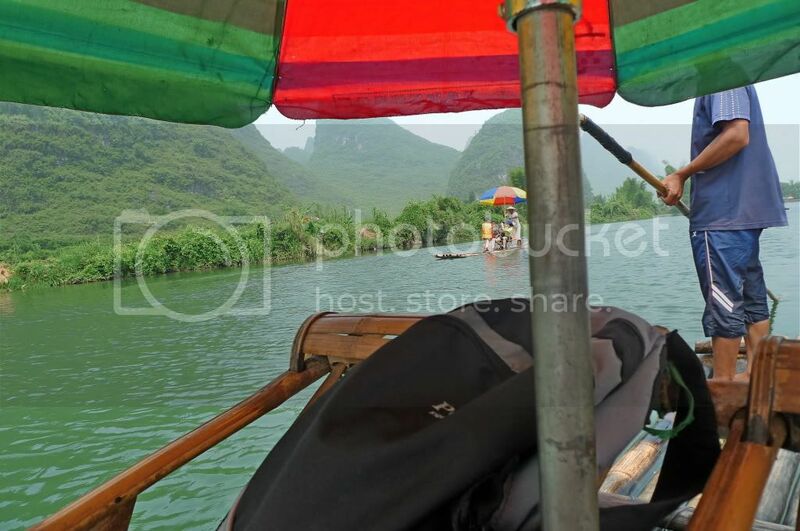 Thanks for taking us on a detailed guided tour on Yulong river looking forward for more 'meet the dragon' adventures. 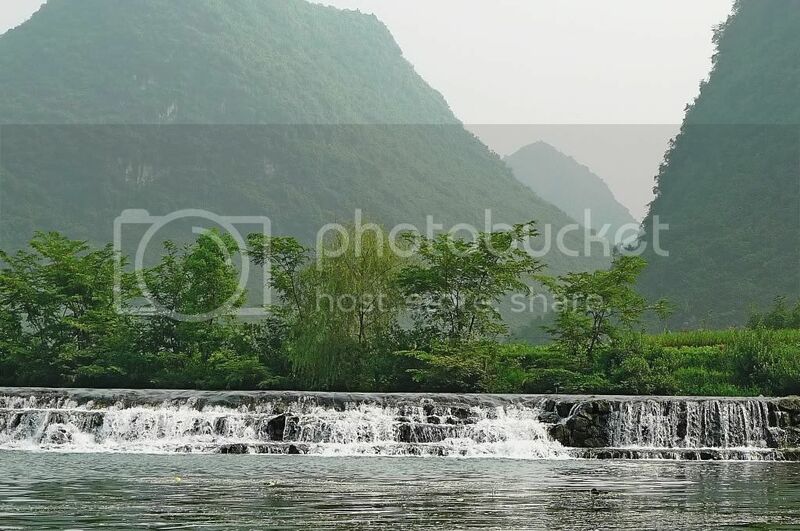 I believe the accident you met has made this Yulong River an unforgettable experience in you for many years to come. Exactly like what your fengshui master had pointed out before you went to Guilin! I am happy to hear that you like the surprise I had installed for you. After all, our journey this time is full with surprise! but wow, the scenery is really so so so beautiful! Ohh I saw the pagodas! Half of it are reflections from water right? oh my god, amazing sceneries!! and i must say the reflections are stunning!! yeah, that mountain looks like a froggie to me, and thanks for telling me how the "pagoda" was formed by the mountains and water.. cool stuff!! 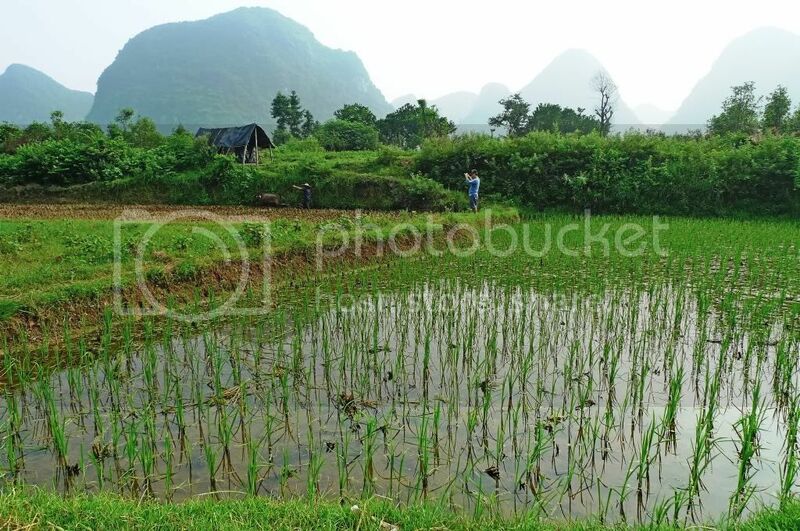 khengsiong, I like to take photos of landscapes and nature, not legged beauties! LOL! cheahs@n, yes it's definitely a pagoda and not something else. Can't see it? 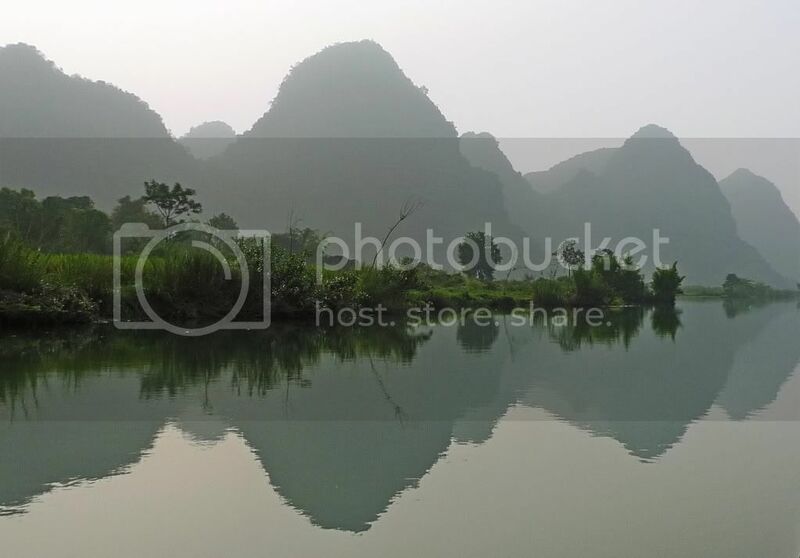 You have to imagine it and combine the hills and mountains with the reflection in the water to create the pagoda image. Yes, chicken and duck talk for 5 hours!! LOL! xin, I am too busy protecting my camera from the water on the way down the weir dam to even attempt to dip my legs into the water! Haha! One thing good about using these rafts I guess is that it is manual and don't pollute the river. But imagine trying to eke a living under the hot sun, day in day out. Makes me thankful of my cushy job. I shouldn't complain abt my job so much. whoa! 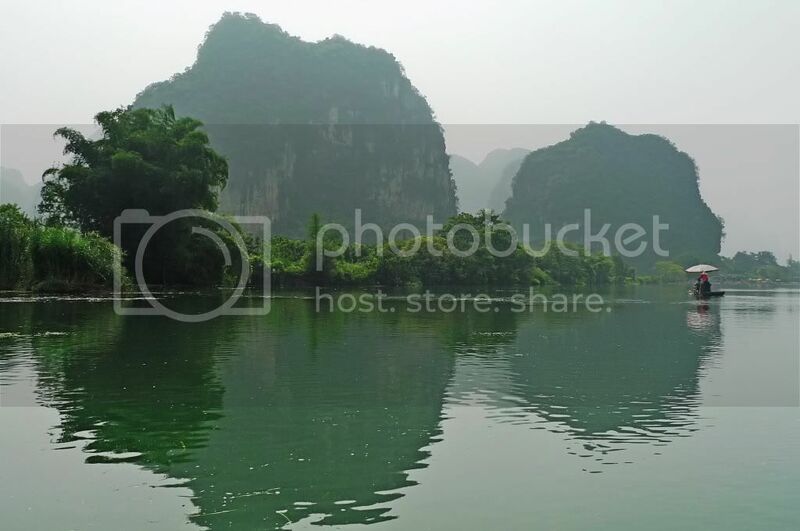 the pictures are beautiful :) the river is so green. why no body swim in the river eh? hmm yes i'd agree with you. the reflection is so beautiful! btw, have you ever thought that a crocodile would break the raft? LOL. omg! i'd be as worry as you if i see that too! and of course i'd be worried about my camera as well!!! gees. sleep while go through the dam? you kidding right? i realize you got a very hairy legs as well LOL. 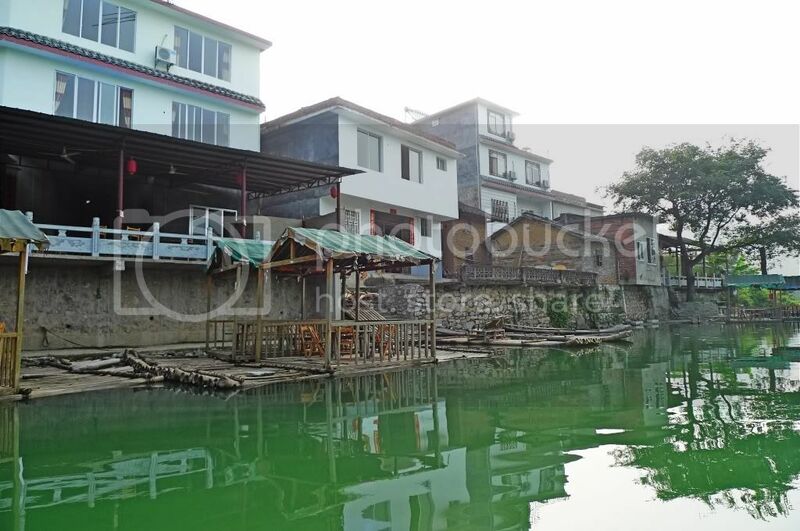 very crisp shots of the surrounding, foong. almost felt the breeze and the sense of tranquility. OIC yes! Can see the pagoda now, aiya bit slow today oops maybe Monday or probably not enough sleep after watching F1 live. Just wondering you sat alone and the other chair is empty, will the raft be "senget"? [not balance]. Please don't get me wrong, not implying you are gigantic. If it "senget" then the manouvering would be tougher or probably just the same? faisal, actually there were some people swimming in the river but I did not get good shots of them. Crocodile? 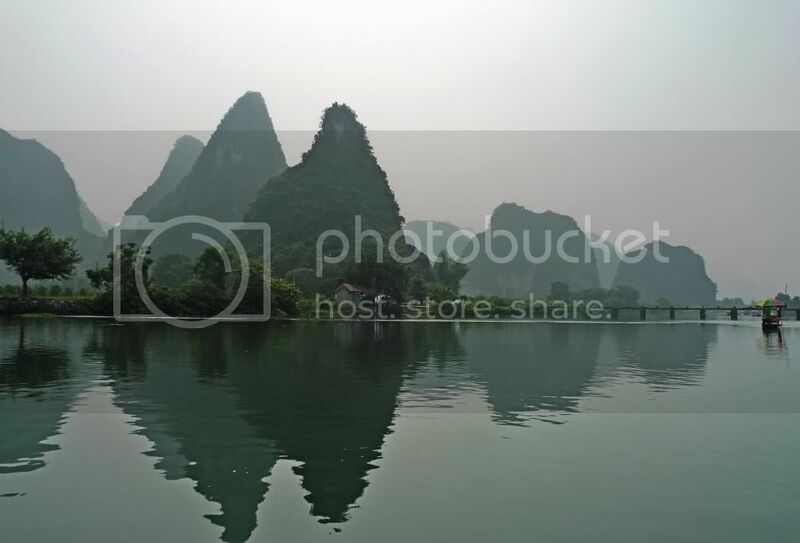 From what I know, there's no crocodiles in Yulong River. If there are, I don't think I would have gone rafting! Luckily that was NOT the surprise in store for me! LOL! My legs are pretty hairy right? Haha! How about yours? LOL! cheahs@n, so you finally see it! Good! Haha, must be not enough sleep still blurry. No, the raft won't go senget cos it's much heavier than me. Btw, I only weigh 63kg, so won't cause the raft to go one sided. Haha! I thing this river is much more serene from previous one. haha :D So did you expect that surprise? Your rafter really know his stuff huh! :p Must be like on roller coaster ride aye. Ouh...so those damns are also used during the dry season as damns? Hmm...now I know. Hahahaha :D Suddenly you show your McD's sandals. Talking about hamburgers huh! Beautiful and lovely shots !! Nice post..
Pagoda I saw! Frog yea it does look like it! I love the picture where reflects the trees in the water.. lovely just lovely. Oh you all had to go by weir dams? Wow... how did the rafter did it? Tilt the raft front first :P? Got seat belt to tie yoursef to the seat or not? Hamburger! Cannot see cheese though... but got McD at your feet :P. How did you even get a McD slippers o_o? the scenery there is so peaceful! very nice! Is that the haze or pure mist? Very haunting effect - nice! Good thing your raft guide skillfully steered you safely over the weir dam....otherwise, you would have gotten a good dunking in the water...hehe. for some reason, i can only view first few pics. the bottom ones are missing. lovely shots and nice reflections. foong your river adventures look really beautiful! Awesome pictures, Foong. Those pictures with the reflection is reminiscent of artwork, like squeezing paint from the tube then folding the paper into half to get the identical imprint. 5 hours on the river? Gosh! That's really a long river-ride. How about meals? Got buffet on board or not? hehe..
Good that there is a stop to observe farmers at work. Must have been quite an experience. Yep! Saw the frog, the hamburger, the McD slippers, and the pagodas. All very nice. The dragonfly - so sweet.. Thanks for reassuring that the rafting is safe though an inclusion of a life-jacket makes the world of difference. I wonder why the Chinese govt did not include that as law together with the licensing?! Ooh! the accident next? Bloody or not? 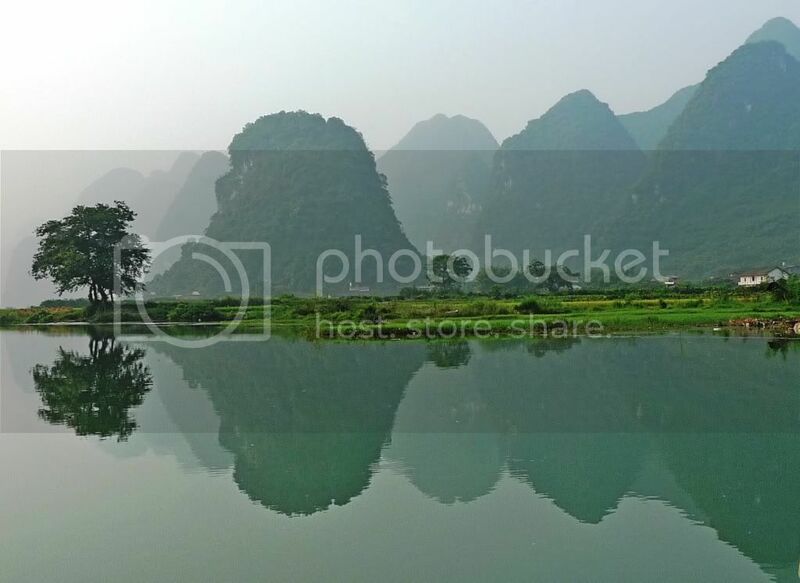 I love the water reflection photos oso!!! SO there goes the much awaited foong's accident! will keep tuned in for your next post! so funny with that hamburger and mcD slippers! the views are captivating. I was trying to pick out the best view but it's just so hard to pin point which is which. I find the natural photo views better to paint than the souvenirs you got! Ohhh, up to now i haven't started on any! Just a little observation here - you have hairy legs. Darn, I wished I had more hair on my legs. I wanna do river rafting too should I go there. 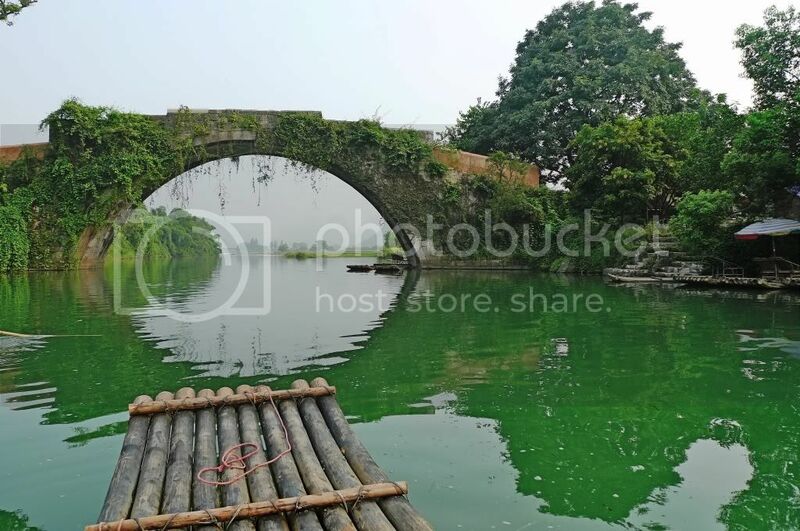 The greenish jade colour water looks very peaceful. 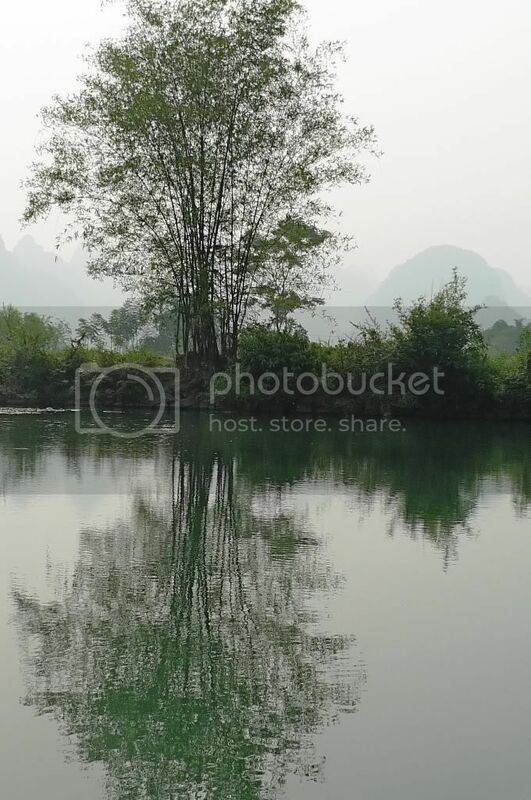 Love the reflexion of the tree on the water surface! Hi, would you like to exchange links with me? 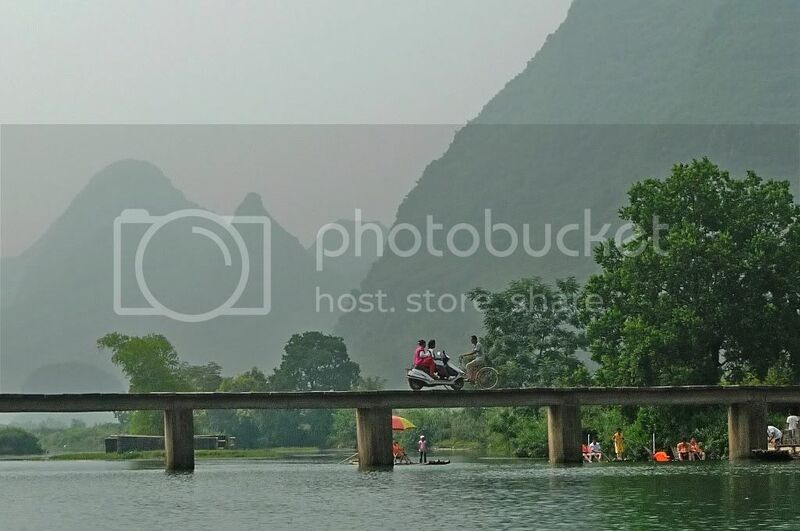 Beautiful pictures you have here and your Yulong River trip sure looks exciting. Thanks for dropping by my blog. 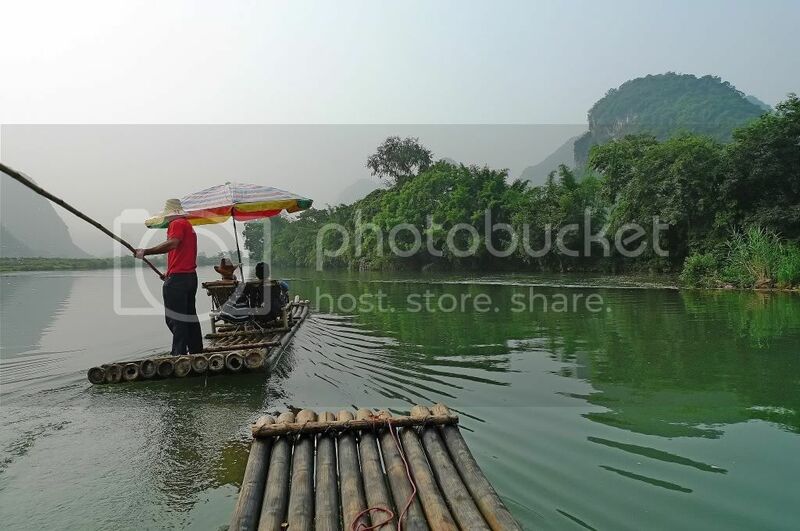 foongpc ~ all of us got carried away by the raft and the nice lovely pixs and totally abandoned pix 16 on rice straws. [kesian on em]. Yeah what are they for? 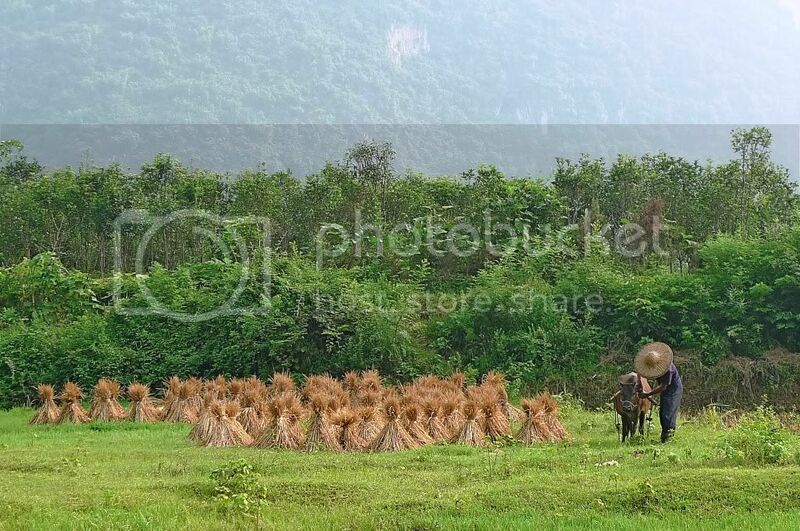 To feed cows and horses or to be burned and used as fertilizers or making straw hats? Simply tembak..
Wow! What a scenic journey! Wouold love to ride on it.. Love how green the water is.. :) Thankfully, nothing happened to your camera. I would have been scaared stiff and like guard it with my whole life if I were you. lol! tekkaus, haha no the dragon is not arapaima gigas - that's a fish! Yeah, old bridge but still standing unlike our stadium! LOL! Yes, I sort of guessed the surprise to be something like that. ladyviral, yeah I also used to think those scenes are fake, but now I know they are real! The McD slippers I got from the hostel where I stayed. Haha! life ramblings, I still don't know why the pictures do not appear complete to you. Maybe connection or server problem? happysurfer,reminiscent of artwork, like squeezing paint from the tube then folding the paper into half to get the identical imprint? Yes, I agree with you! Haha! I don't know why the Government didn't include life jackets - maybe they think the rafters can save us if we fall into the river? LOL! So it's good to have hairy legs? LOL! eiling lim, yeah, it's probably called toad hill or frog mountain or something! LOL! Whew! It was a very exciting tour I had. I feel like I was tagging along with you on that river rafting of yours! Great post! ayie, don't worry and don't put pressure on yourself. But don't take too long! LOL! I was pretty impressed with your insightful thoughts that really did inspired me and helped me anticipate essential informations regarding rafting adventure which I actually want to learn and give emphasis with. your article is not just useful but at the same time very much productive! Thanks!